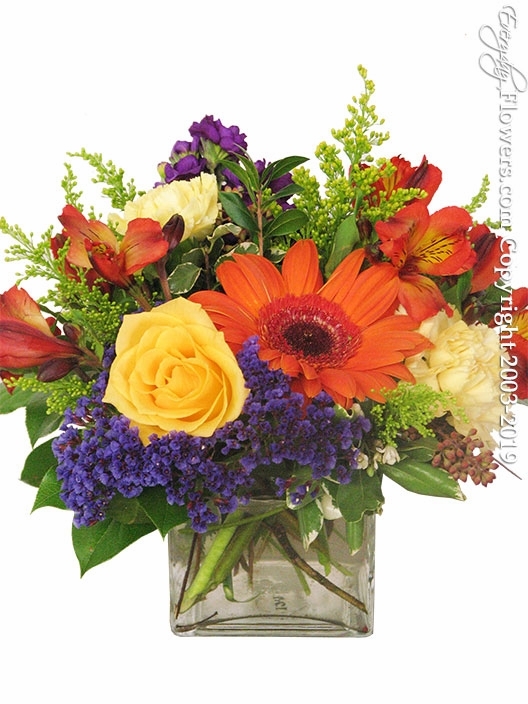 Made of similar designs each series features a design created in different color combinations. 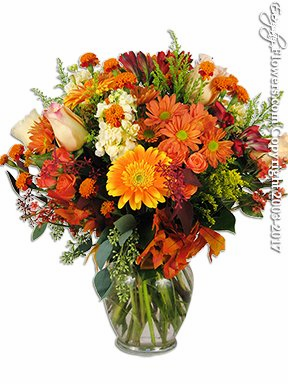 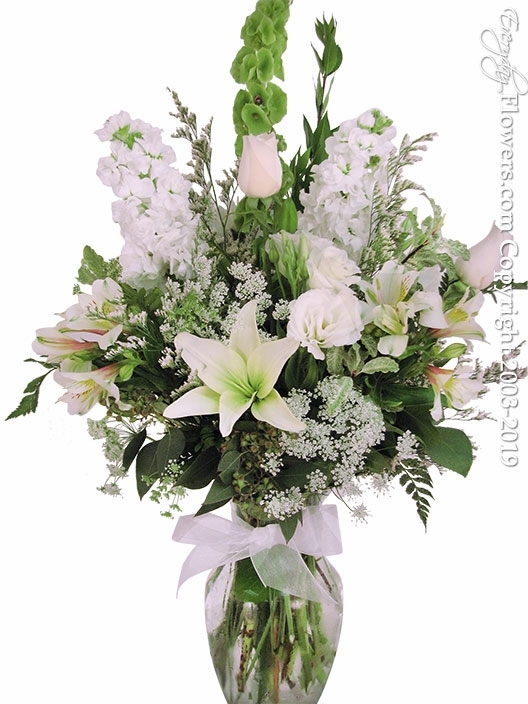 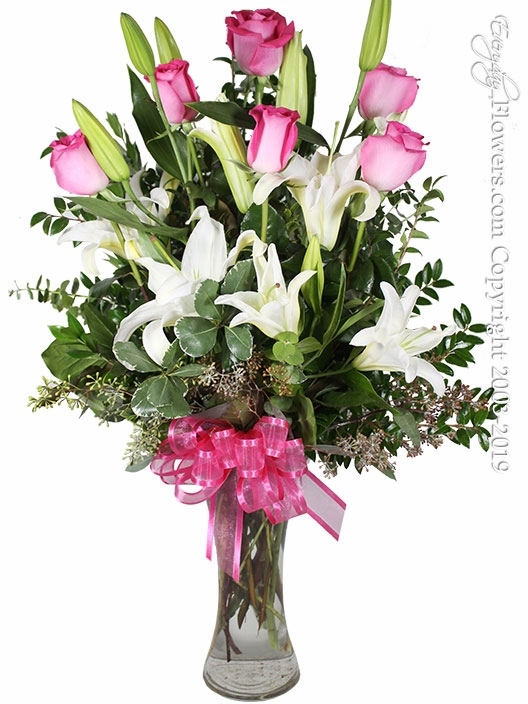 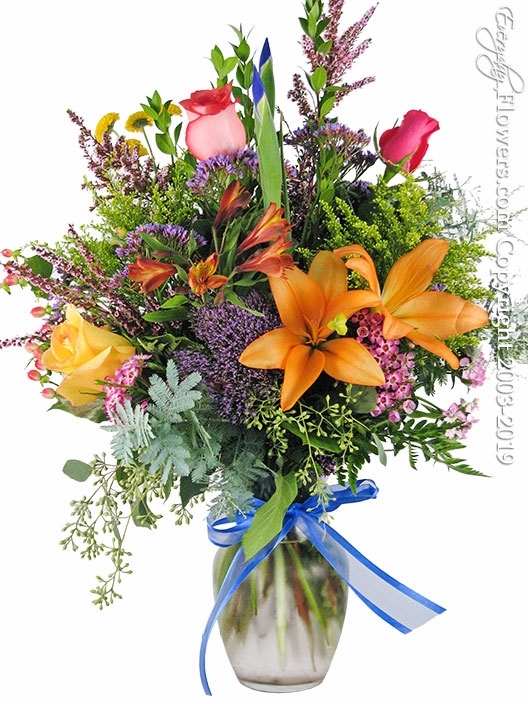 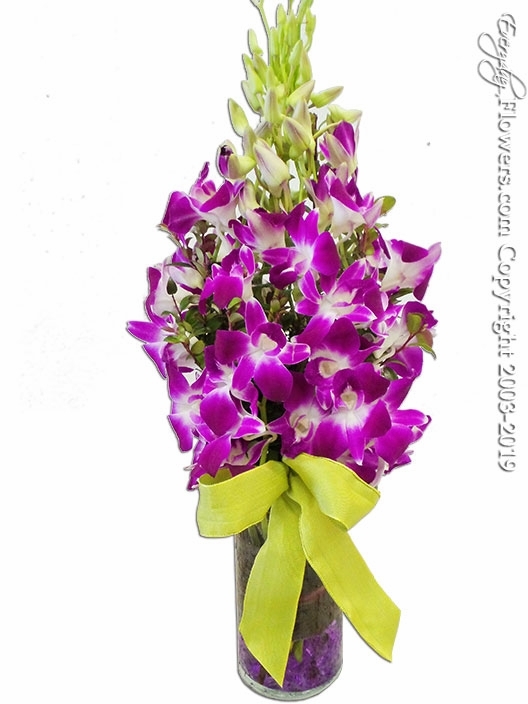 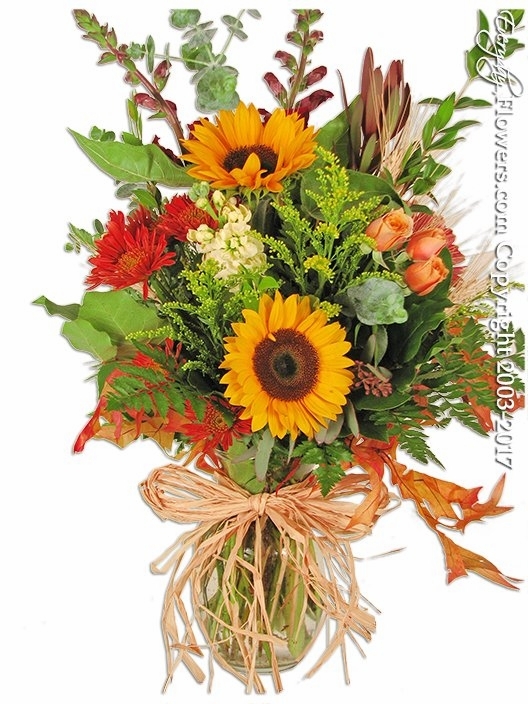 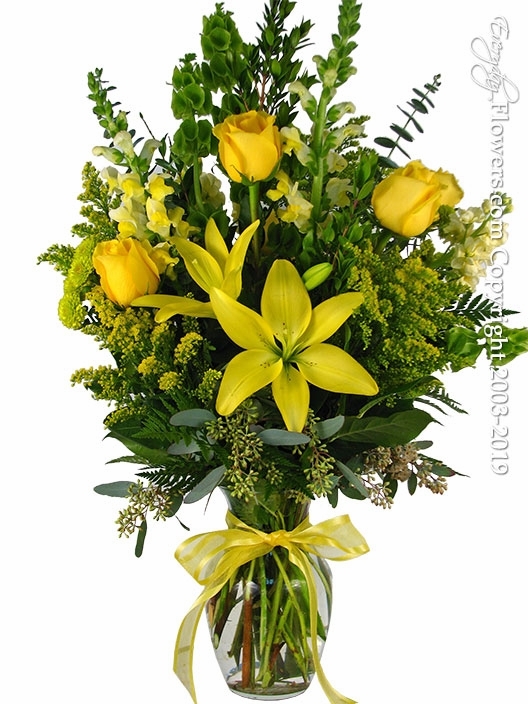 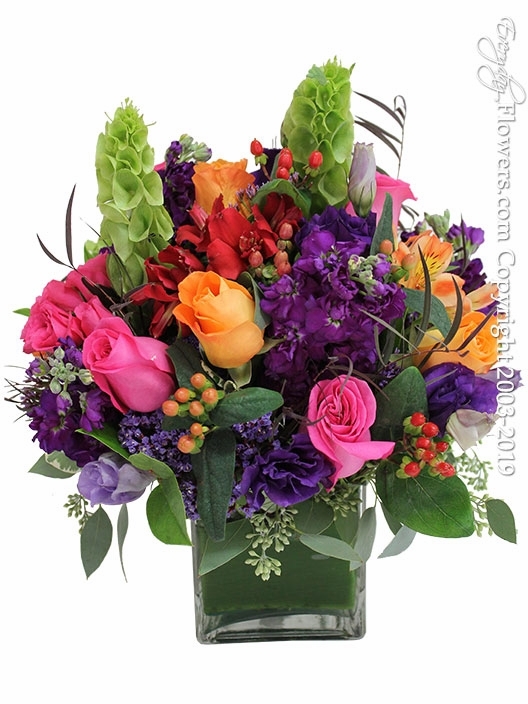 We are one of the few flower shops that continually develop our own products for our customers and offer many of them for same day delivery to the Orange County California area. 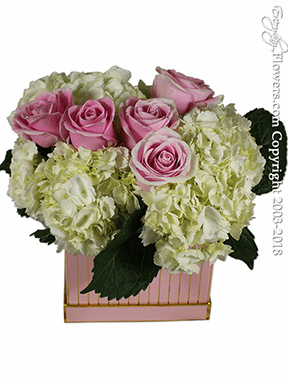 The Blooms Series by Everyday Flowers. 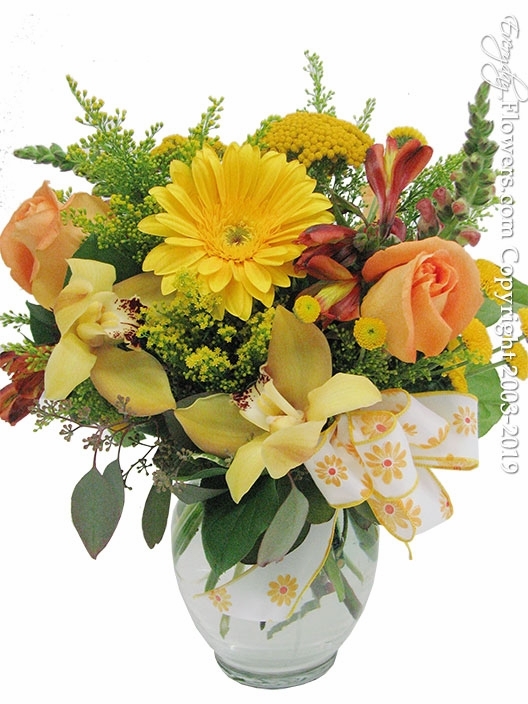 This line of products features compact flower arrangements that have been created in a ginger vase. 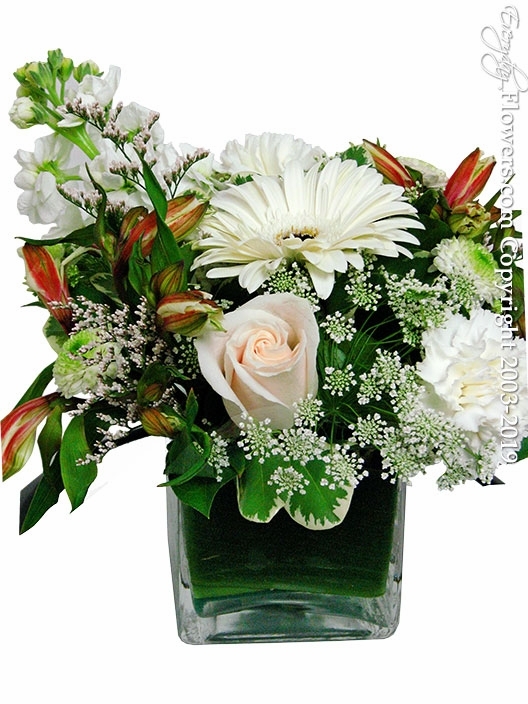 Keeping the stems cut short and having the blooms of the flower close to the water source helps your flowers last longer. 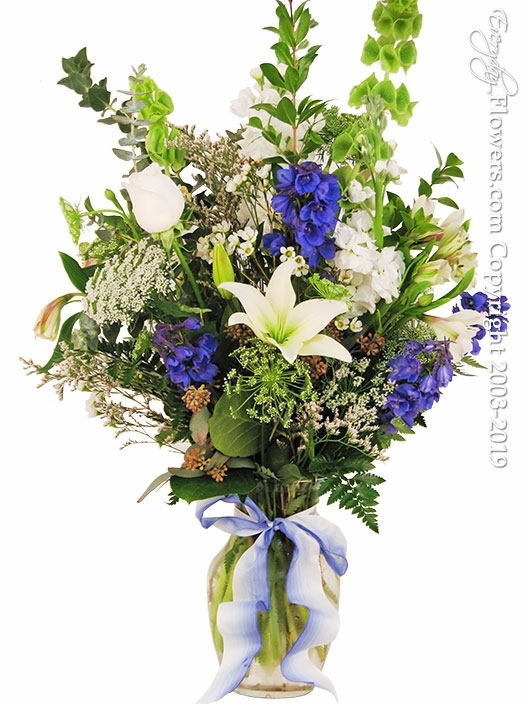 Compact and lush designs make a great impression for any occasion. 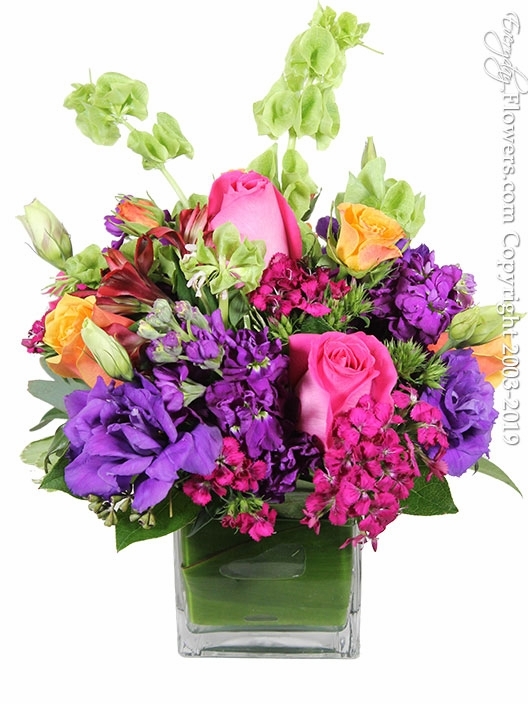 The Colorful Blossom by Everyday Flowers. 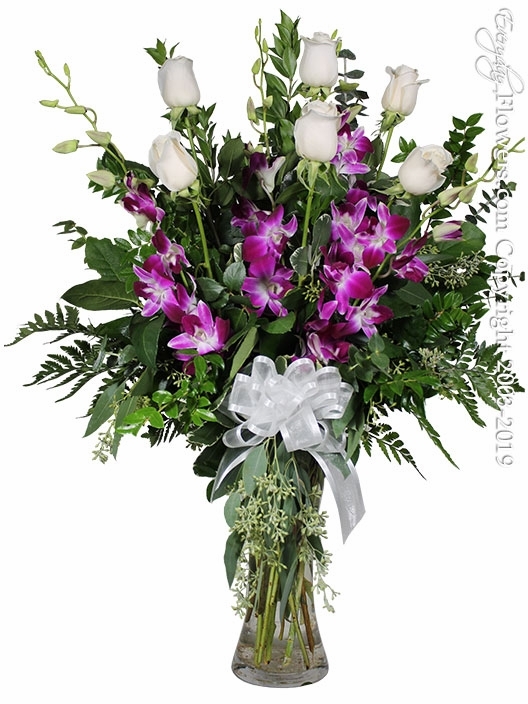 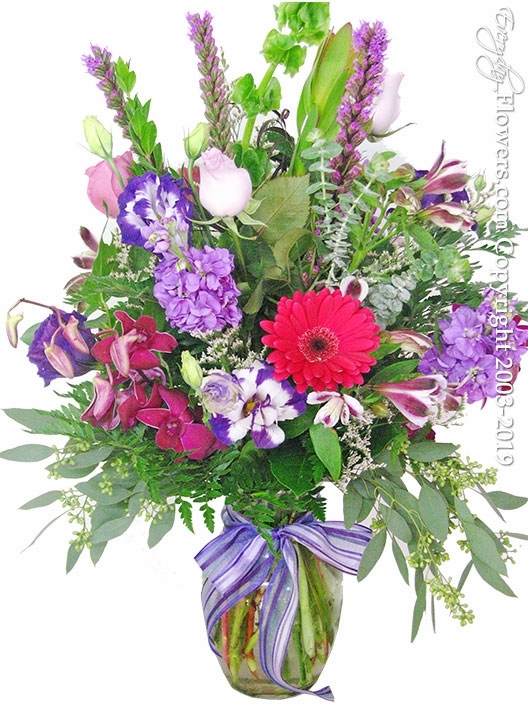 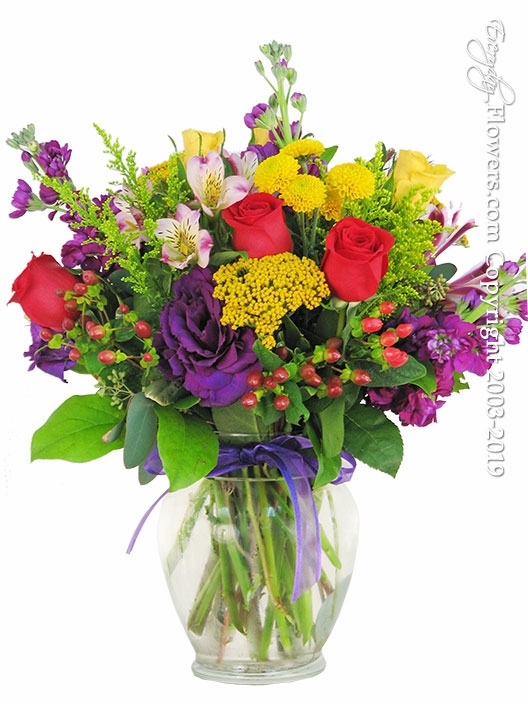 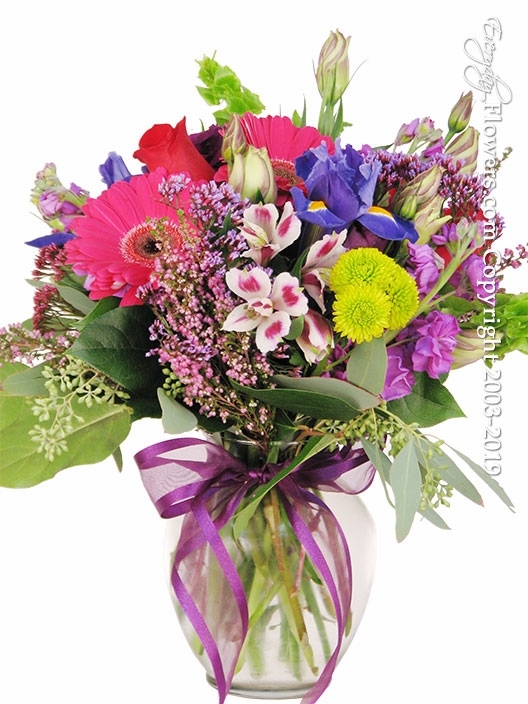 This colorful flower arrangement uses specific colored roses with purple stock and purple lisianthus. 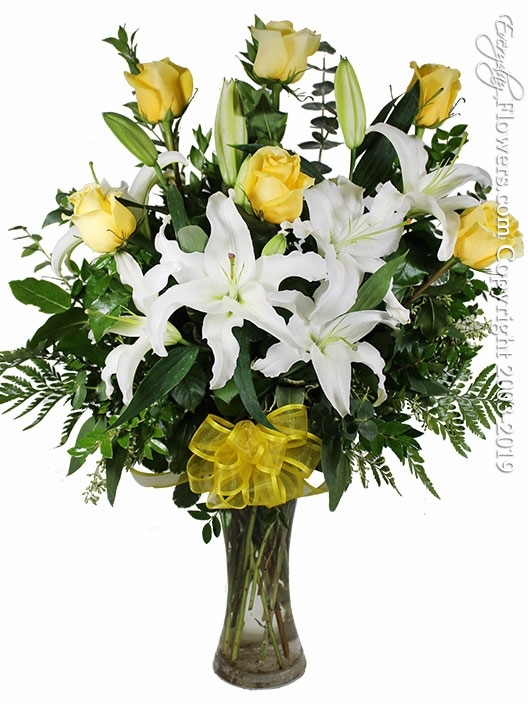 The bells of ireland really stand out and of course the tea leaf wrapped inside of the vase really completes the arrangement. 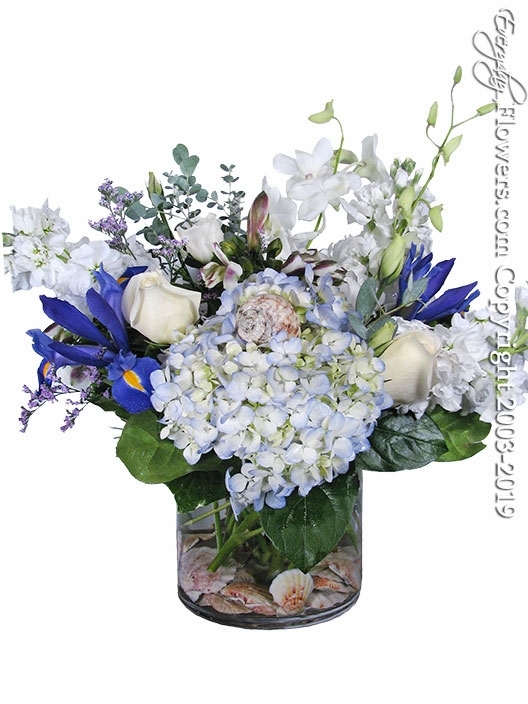 Long And Low Flower Arrangements by Everyday Flowers. 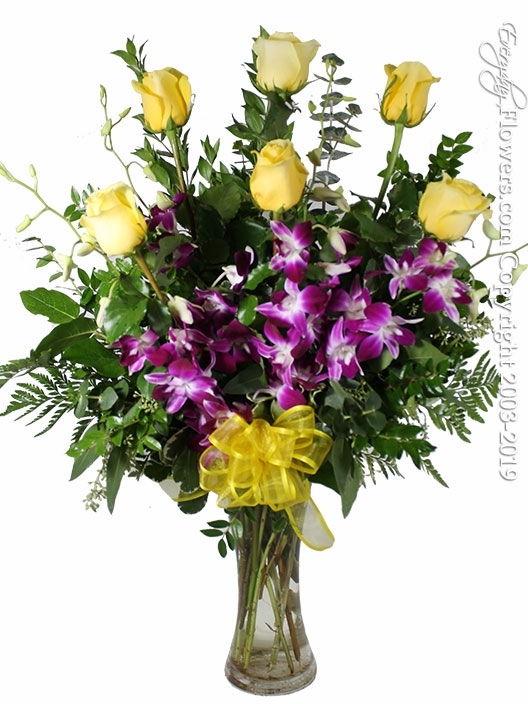 Our Long And Low arrangements are perfect for any occasion or event. 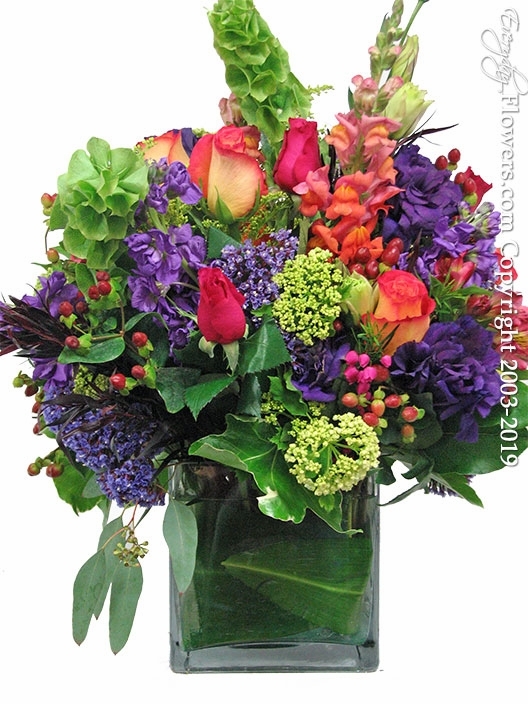 The Garden Series by Everyday Flowers. 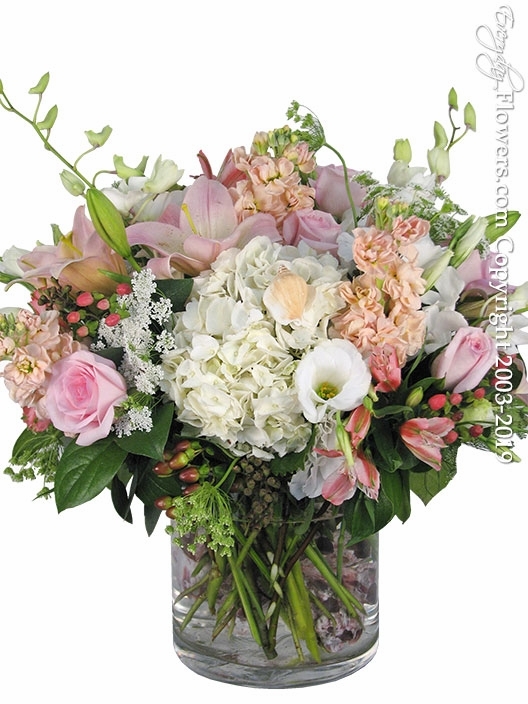 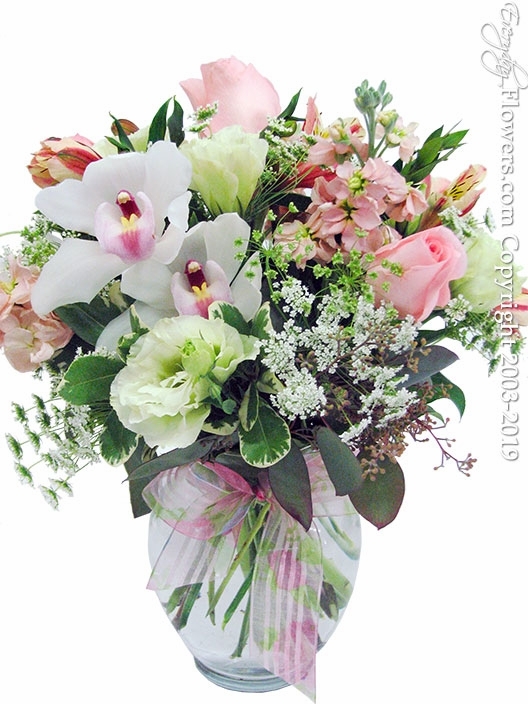 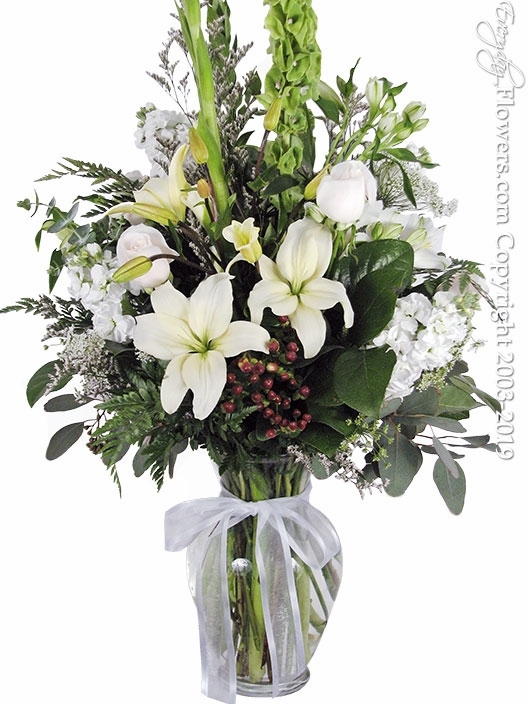 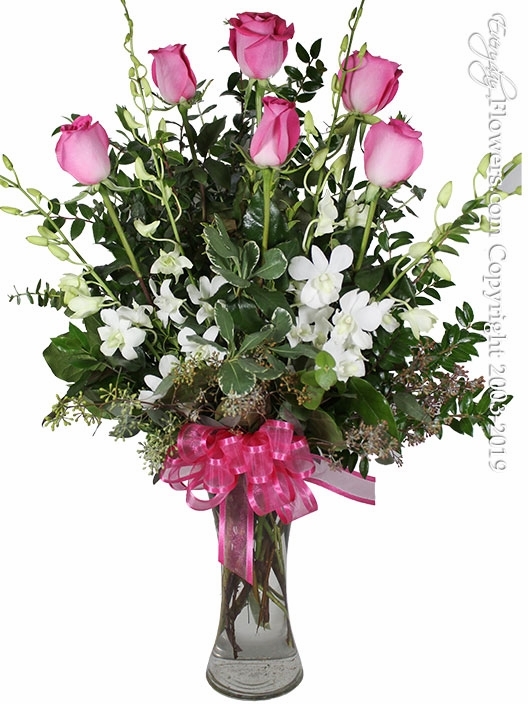 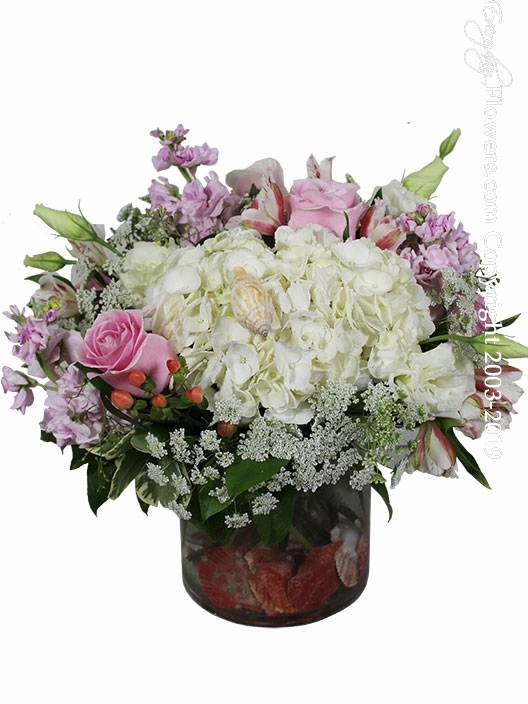 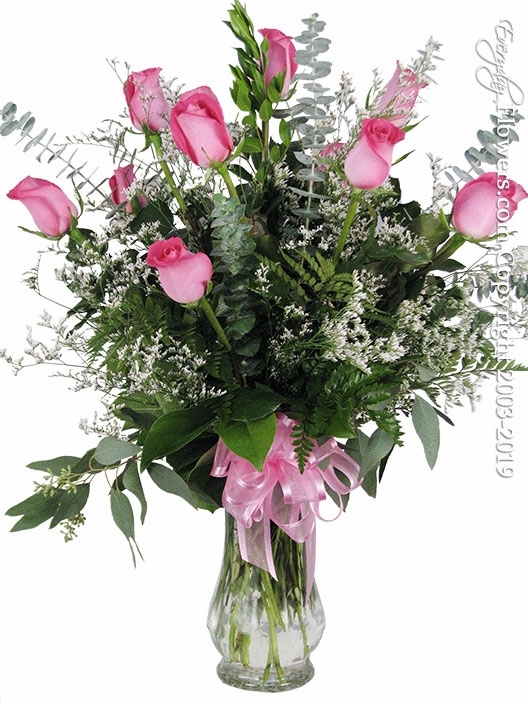 This line of products features a more traditional look of tall and airy flower arrangements. 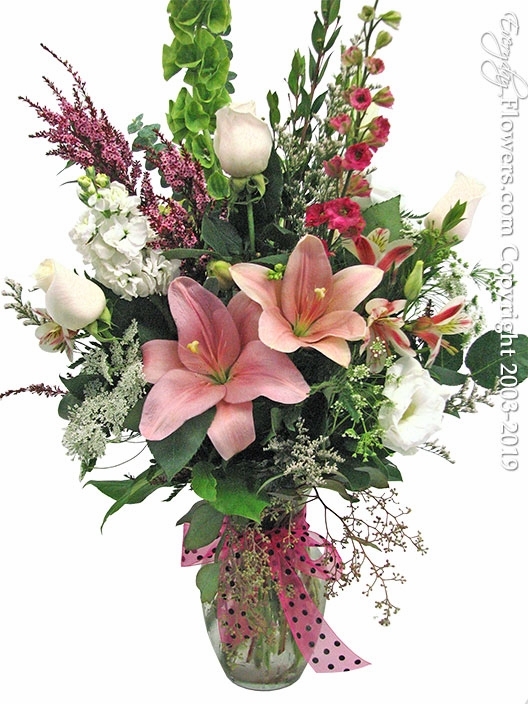 But what makes these arrangements different is the combination of different fillers into the arrangement adding more uniqueness to the types of flowers in each arrangement. 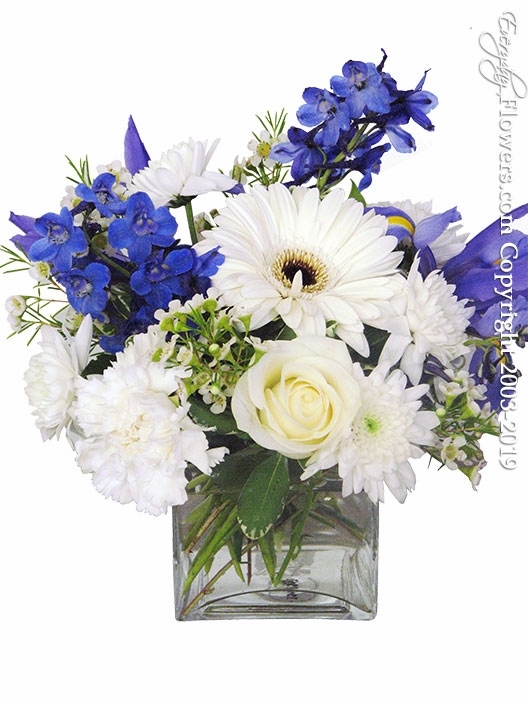 Thinking Of You Flower Arrangements by Everyday Flowers. 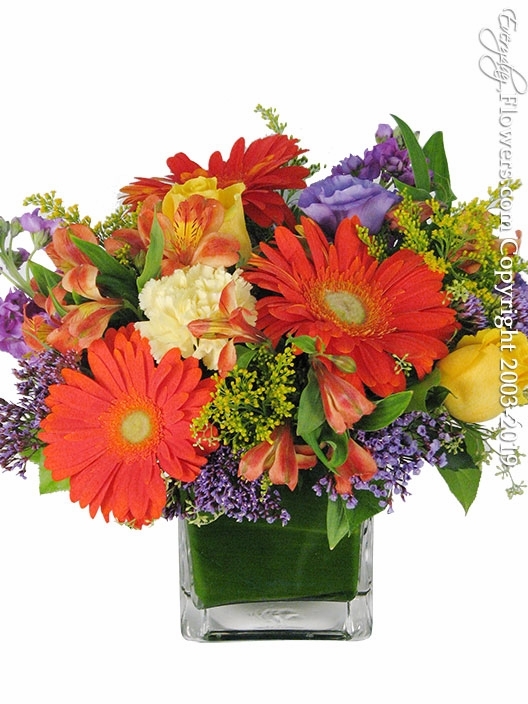 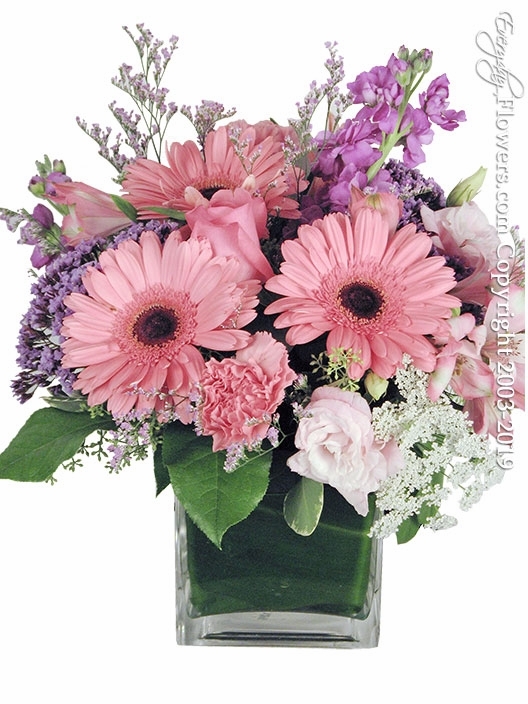 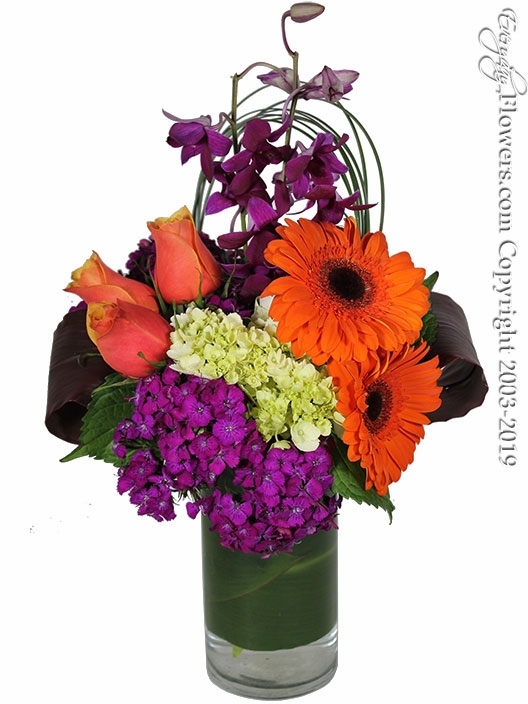 Using four inch cube vases we have created multiple colored arrangements using Gerbera daises roses and Alstroemeria. 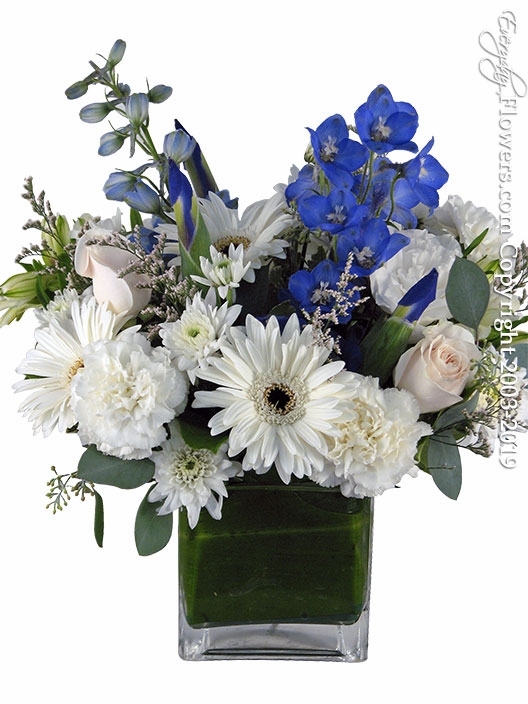 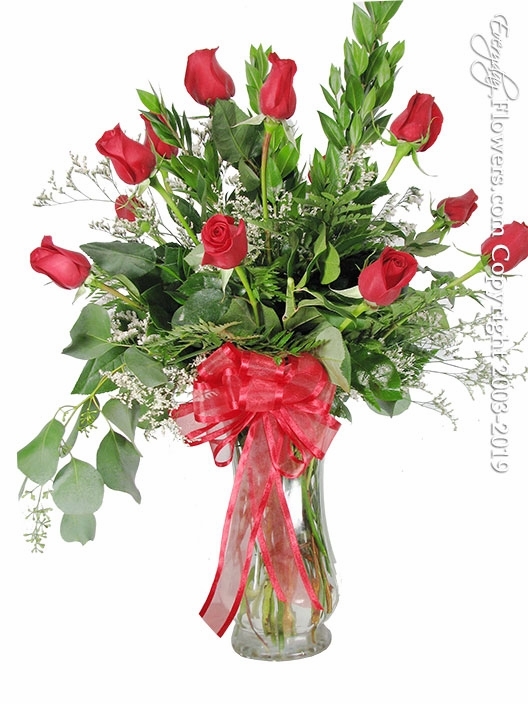 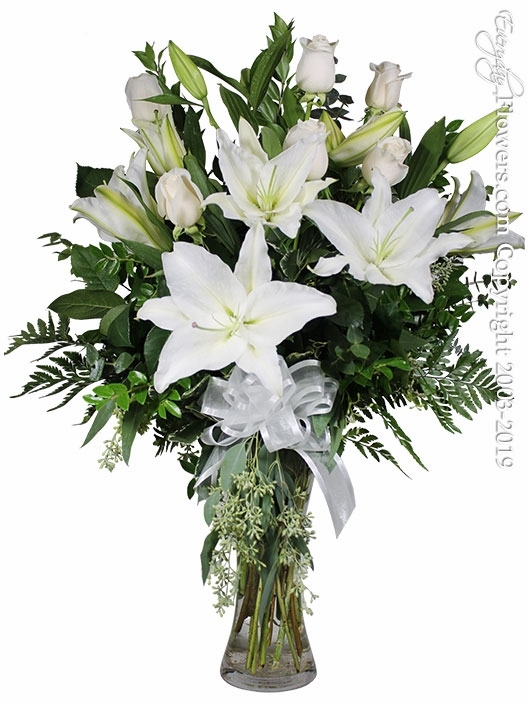 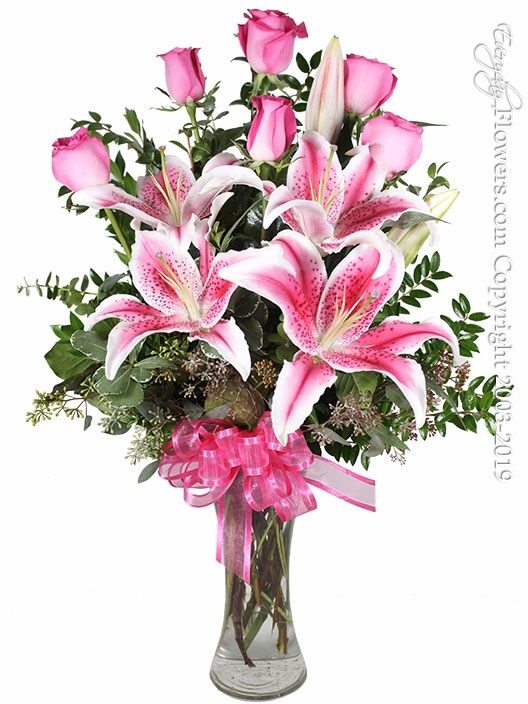 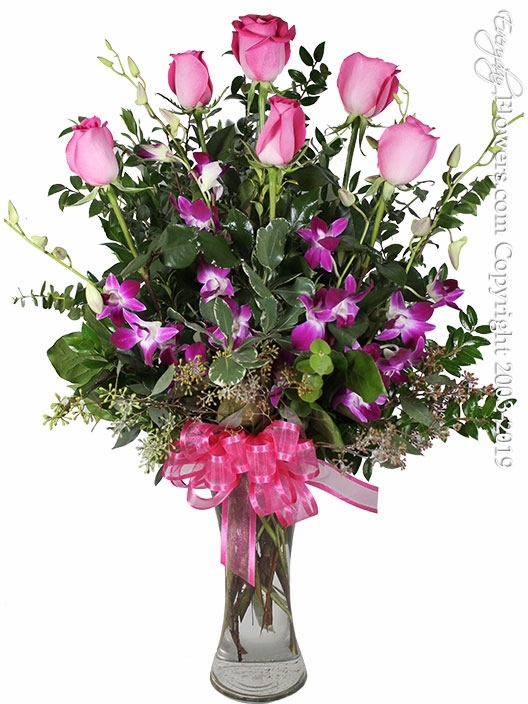 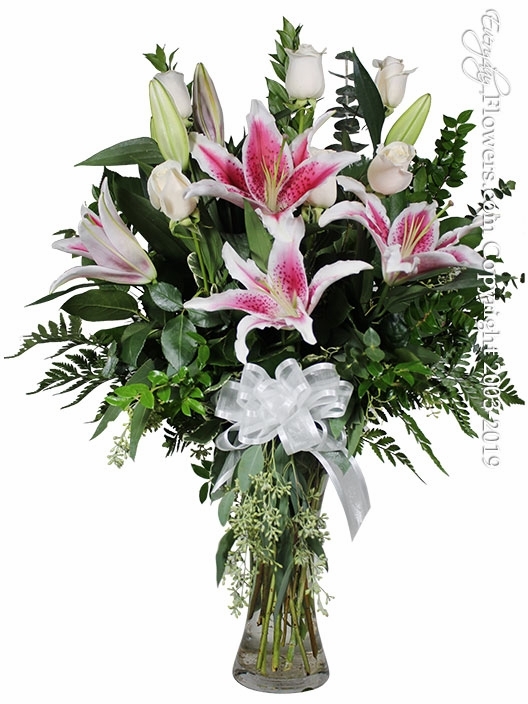 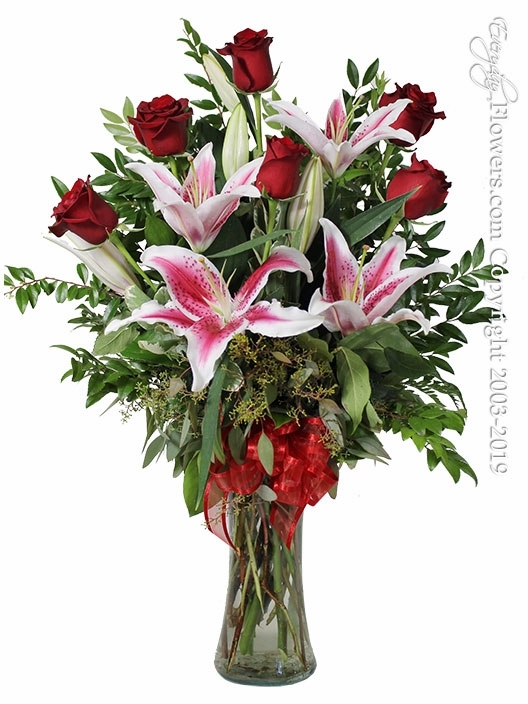 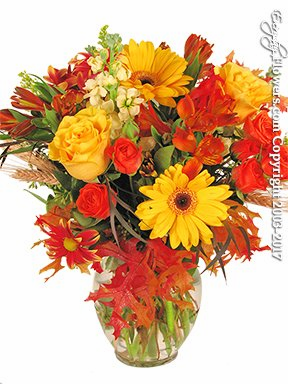 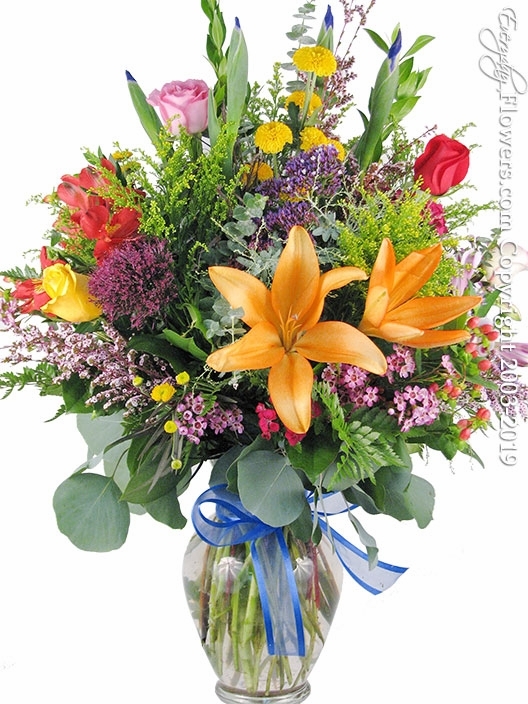 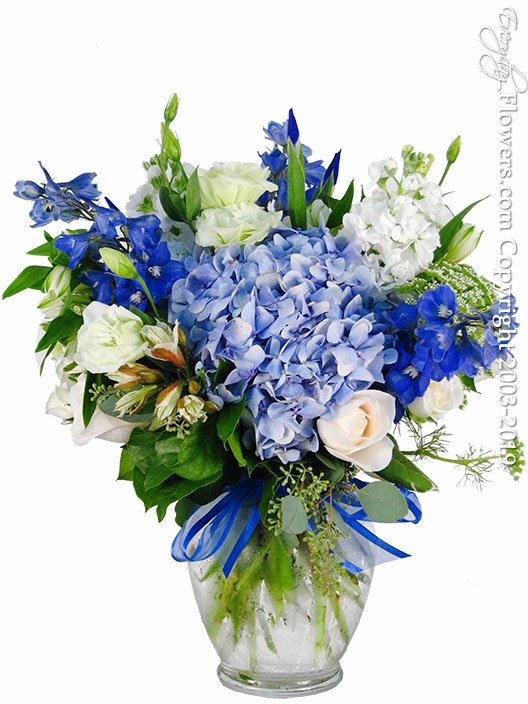 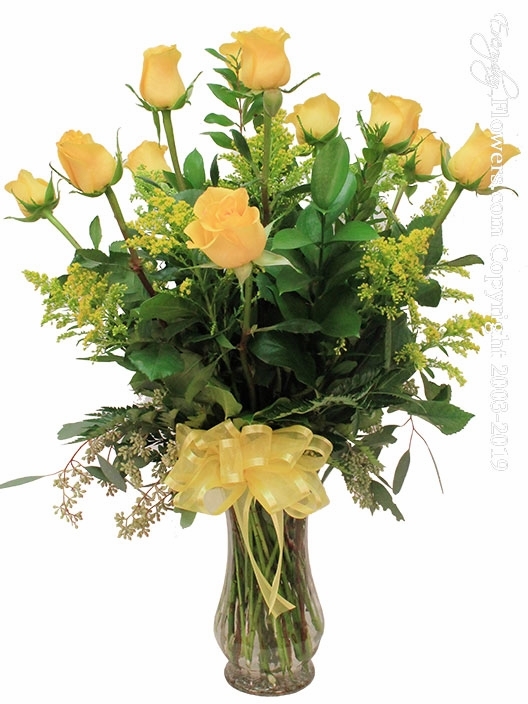 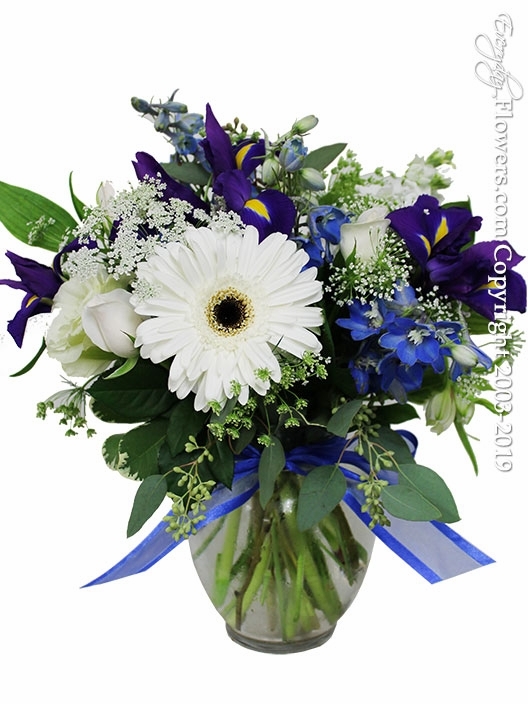 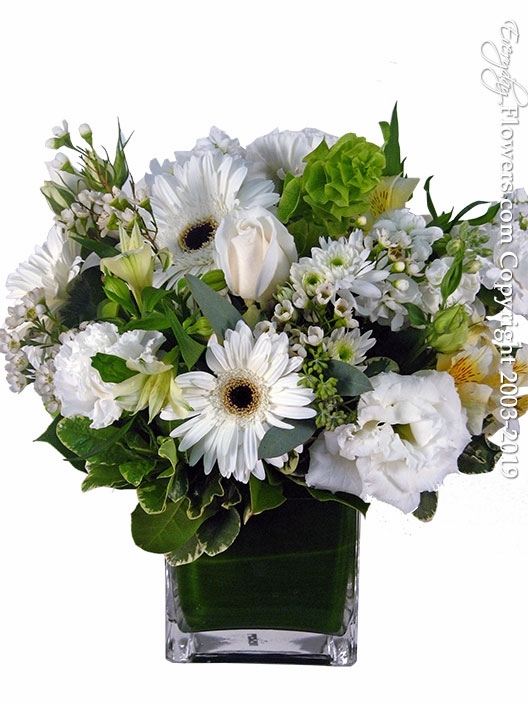 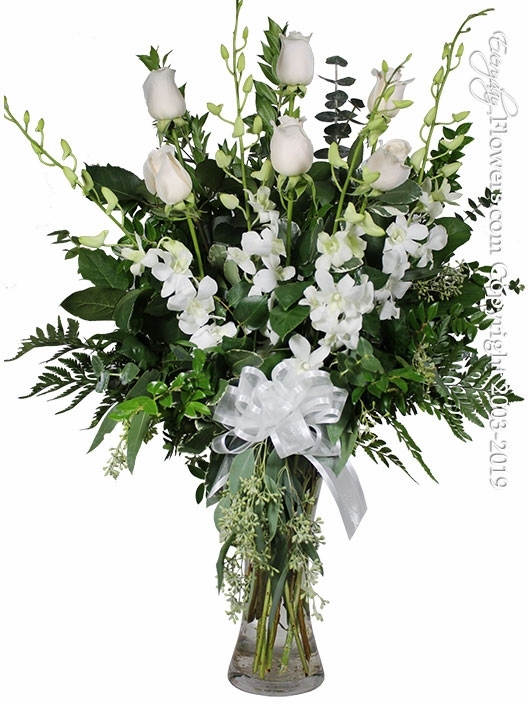 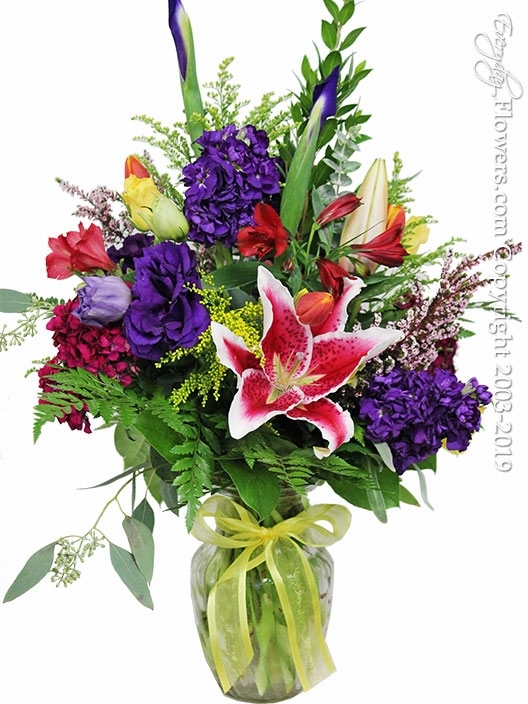 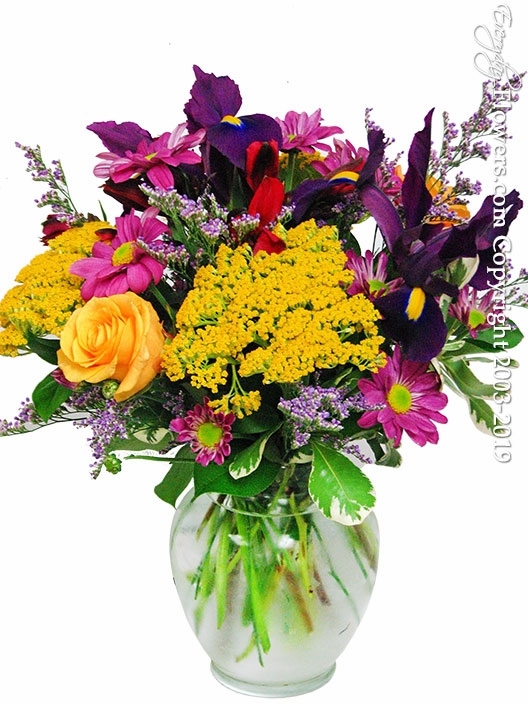 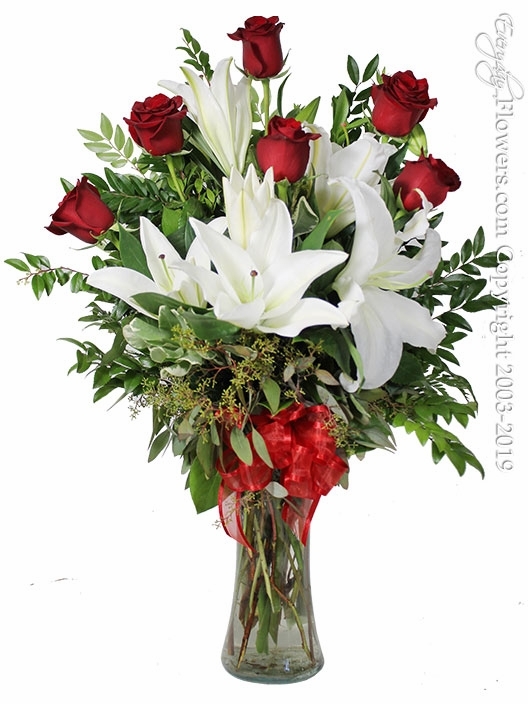 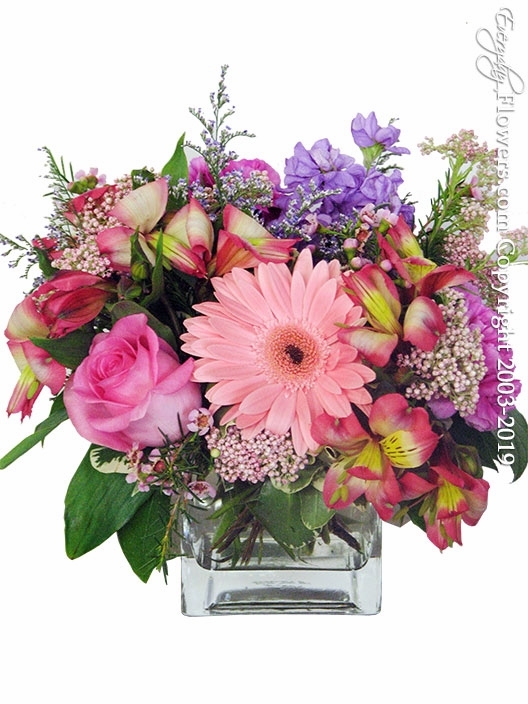 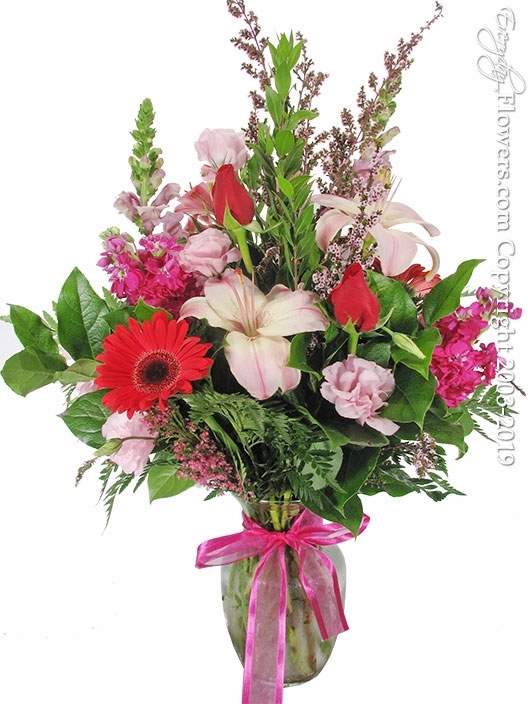 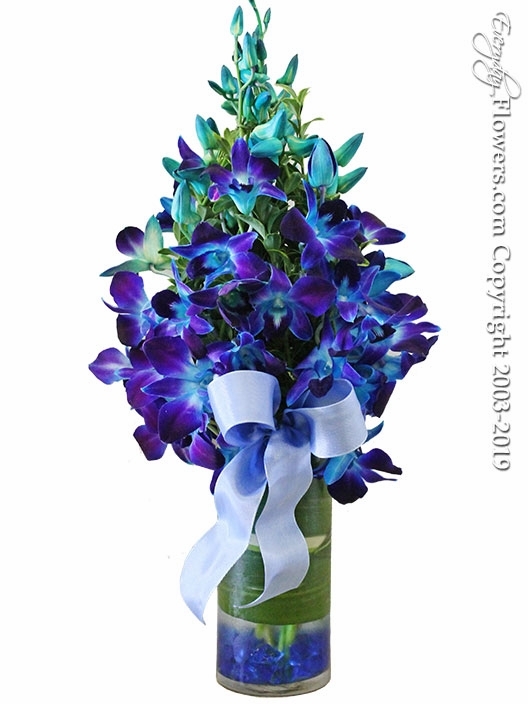 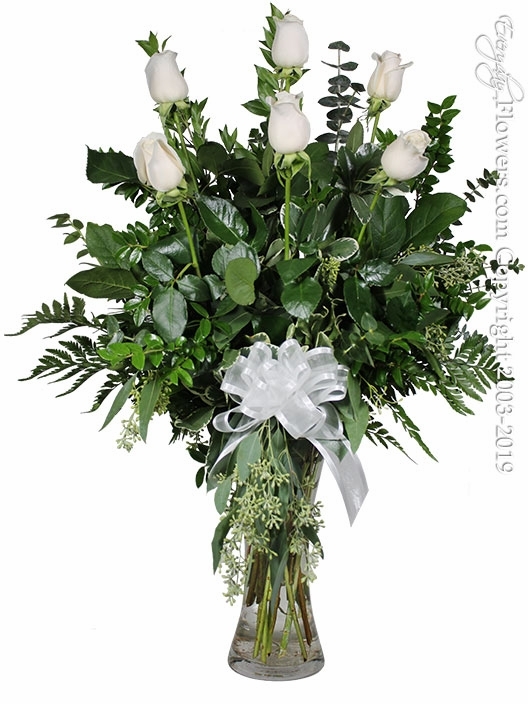 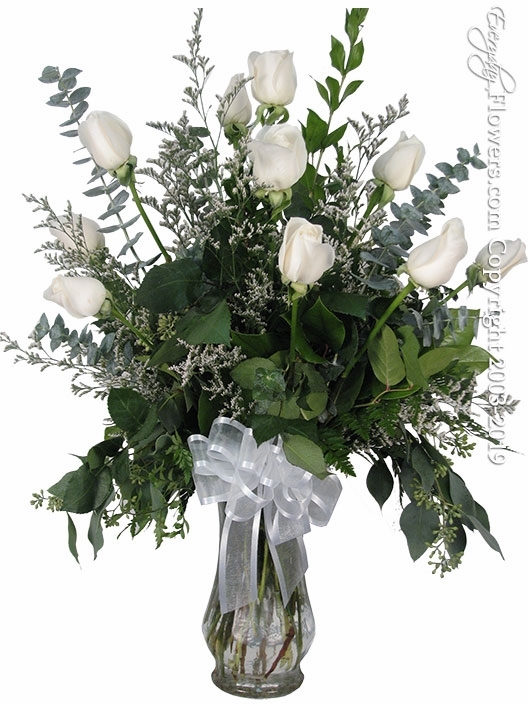 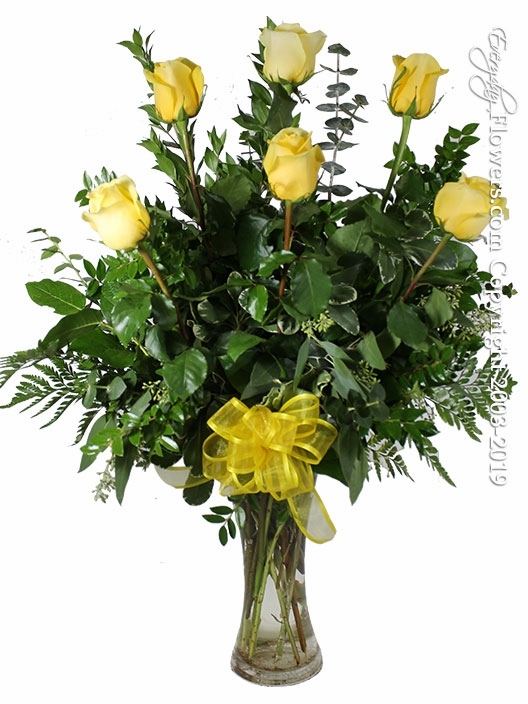 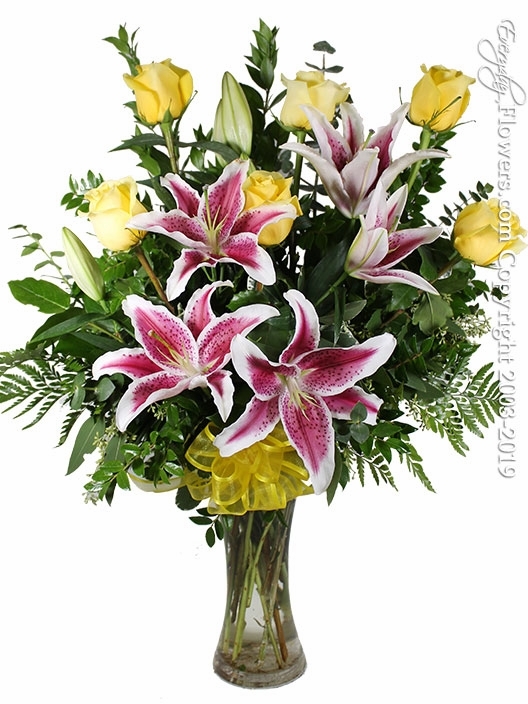 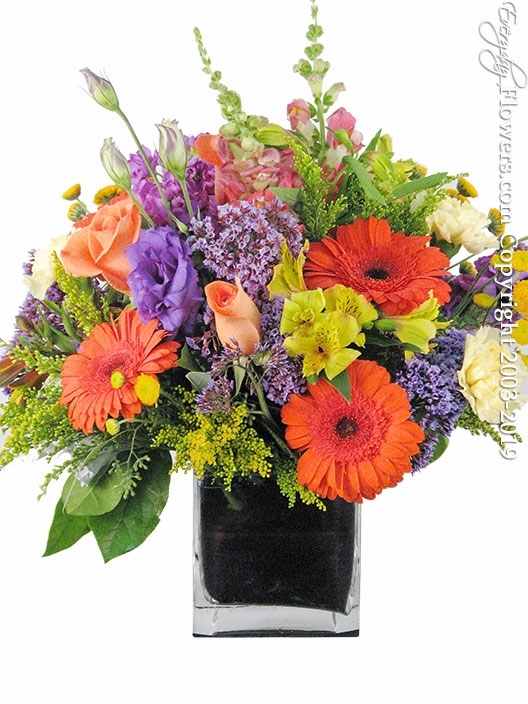 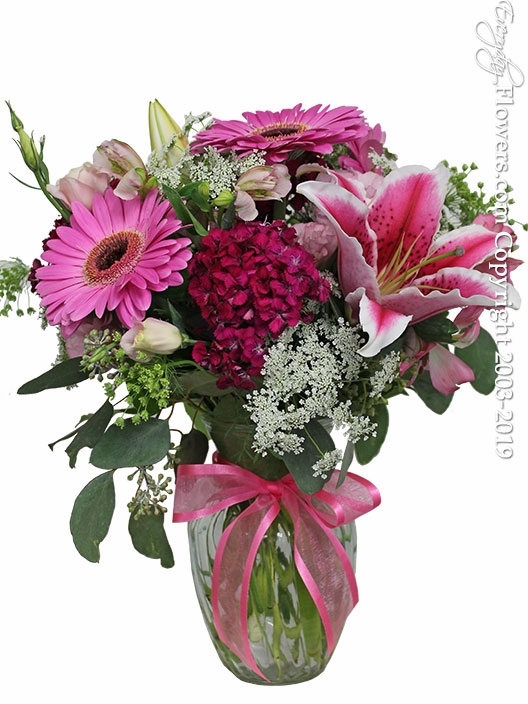 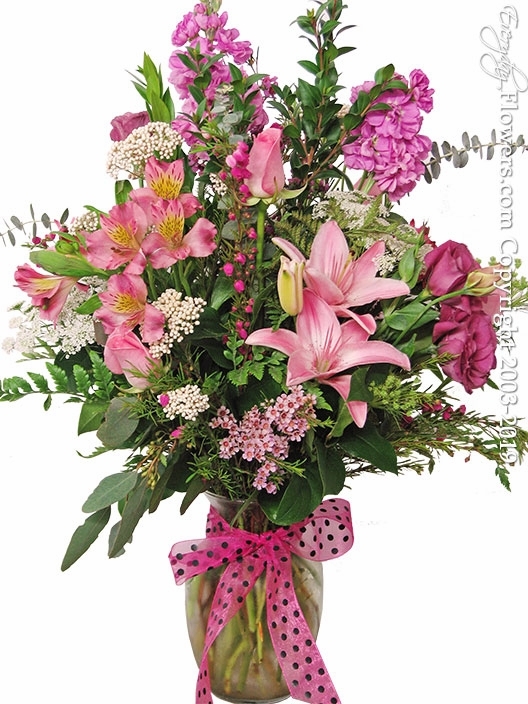 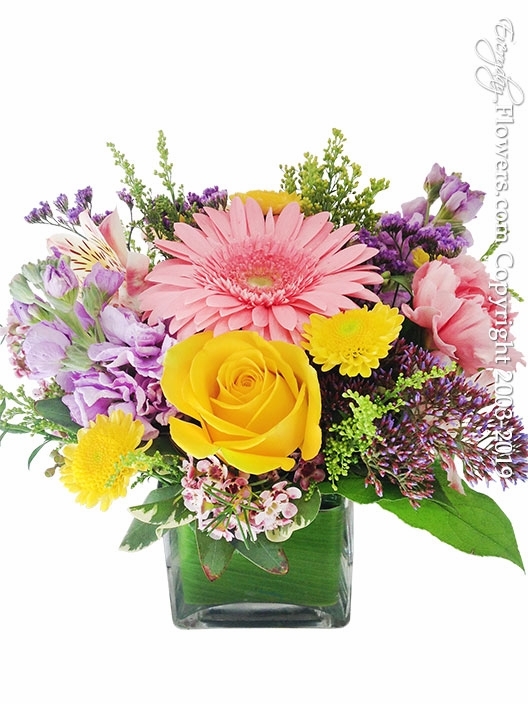 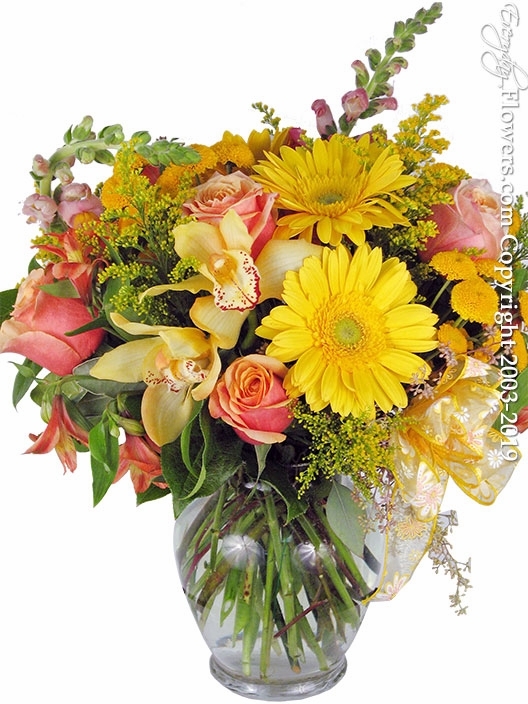 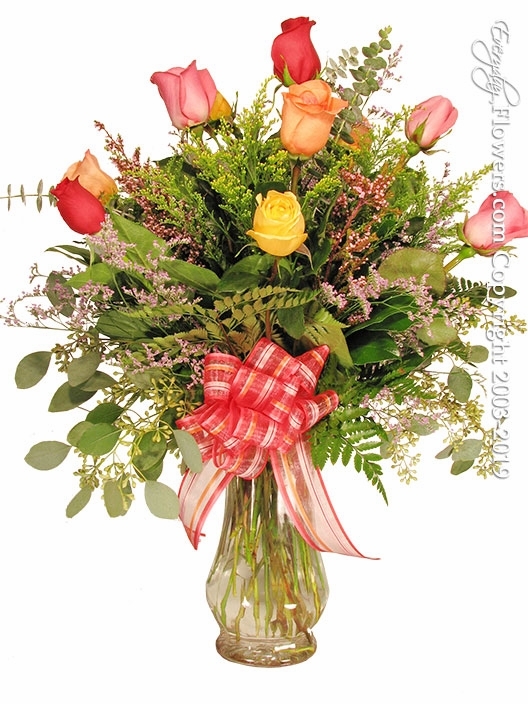 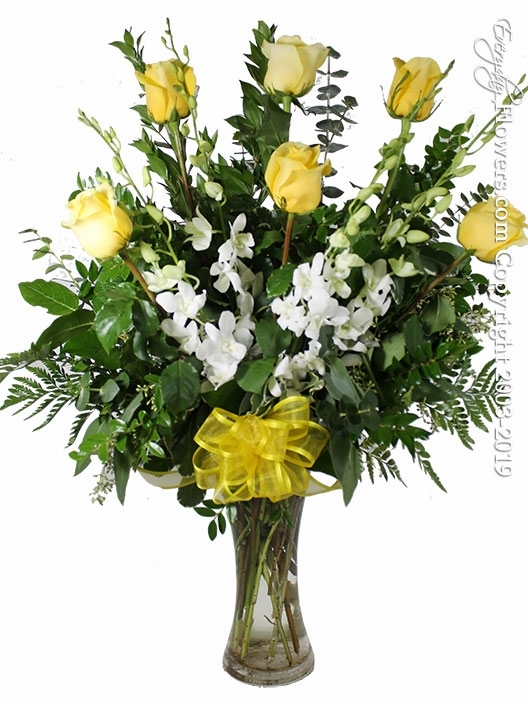 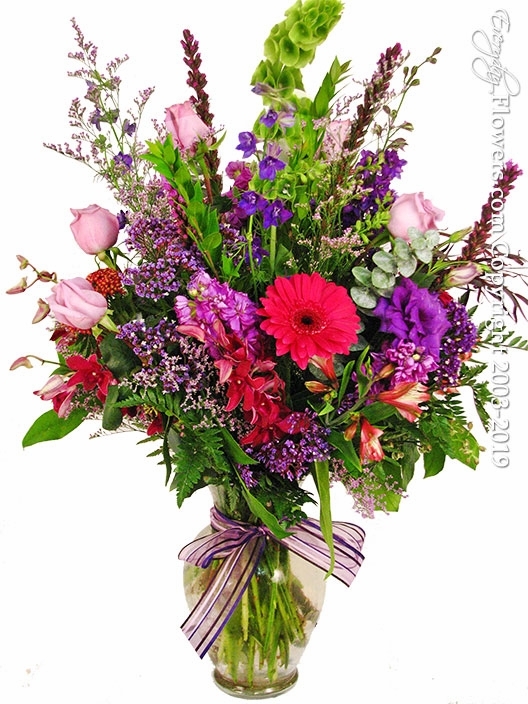 Starting at $34.99 these flower arrangement send your thinking of you thoughts with upgrades available for each size. 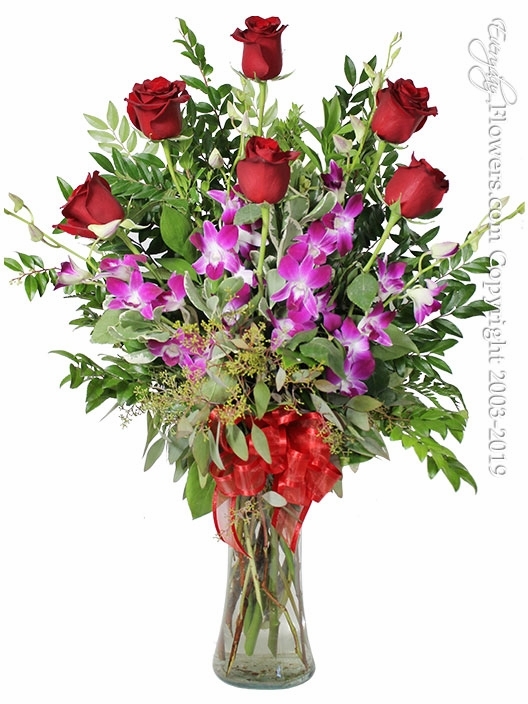 Available for delivery in Orange County California and available for pickup at Everyday Flowers. 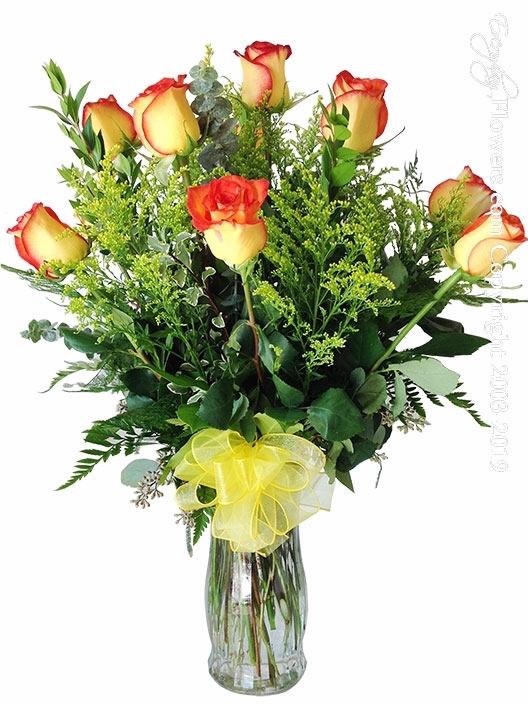 A dozen roses arranged in a 9 inch glass vase using imported long stem roses. 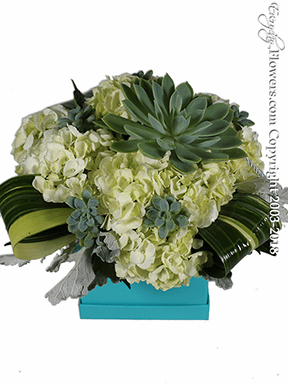 We use assorted fresh greens including lemon leaf fern leather silver dollar eucalyptus Italian ruscus and seeded eucalyptus. 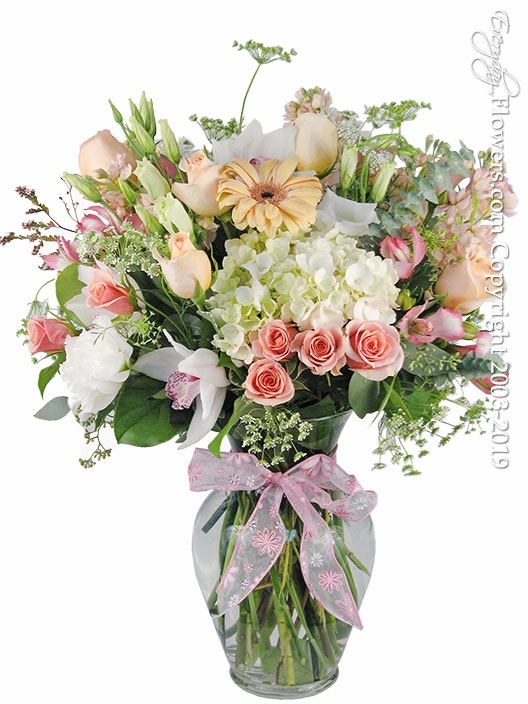 We hi-light our roses with quality fillers including misty queen annes lace solidaster and seasonal wax flowers and always a matching ribbon crafted by our designers. 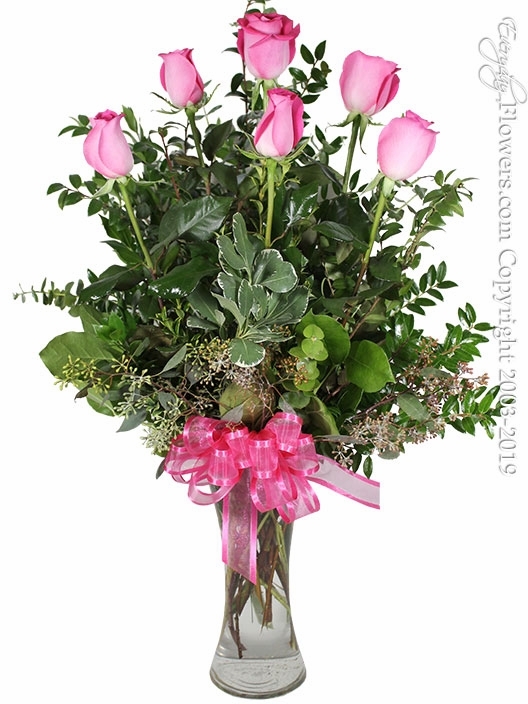 Let Everyday Flowers create one of these stunning rose arrangements guaranteed to be fresh and long lasting. 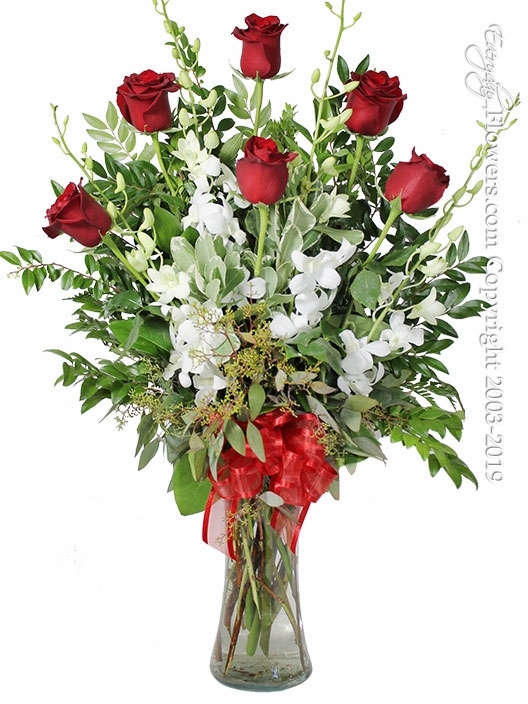 Half dozen roses arranged in a cylinder glass vase using imported long stem roses. 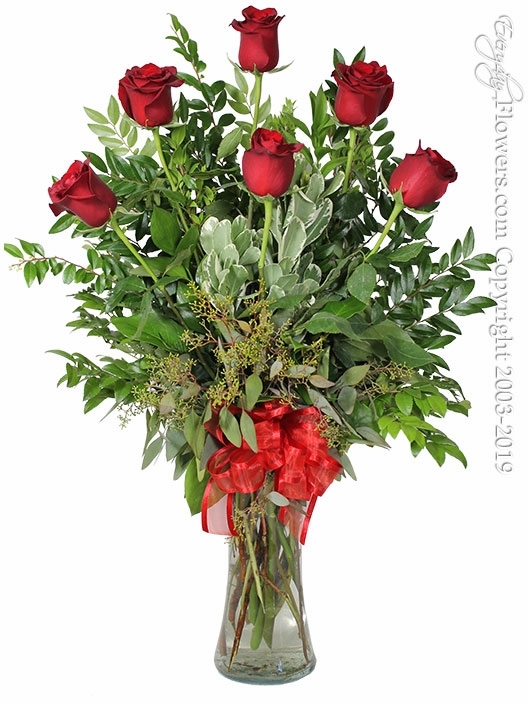 Send these half dozen roses in choice of colors available for same day delivery to all cities located in the Orange County California area. 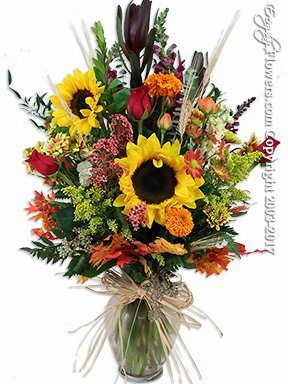 Everyday Flowers will hand deliver what you see on our website and the recipient will never have to put there own arrangement together. 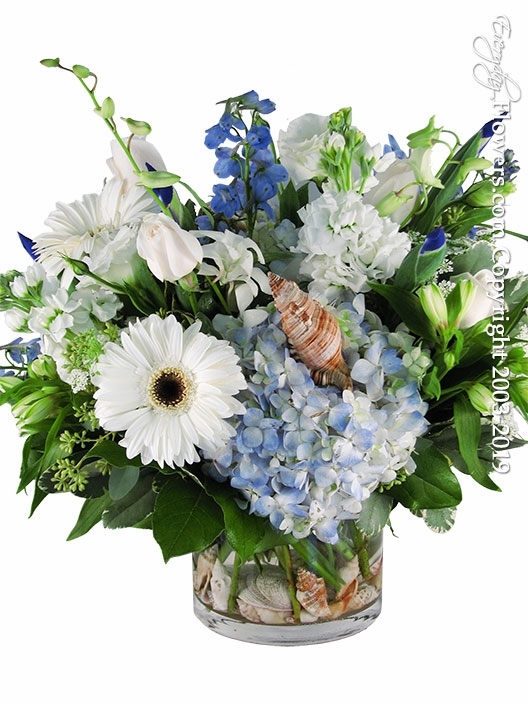 Using Hydrangea and placing Sea Shells inside of the vase and within the flower arrangement our Ocean Garden arrangement is a compact and lush arrangement that can be sent for any kind of occasion. 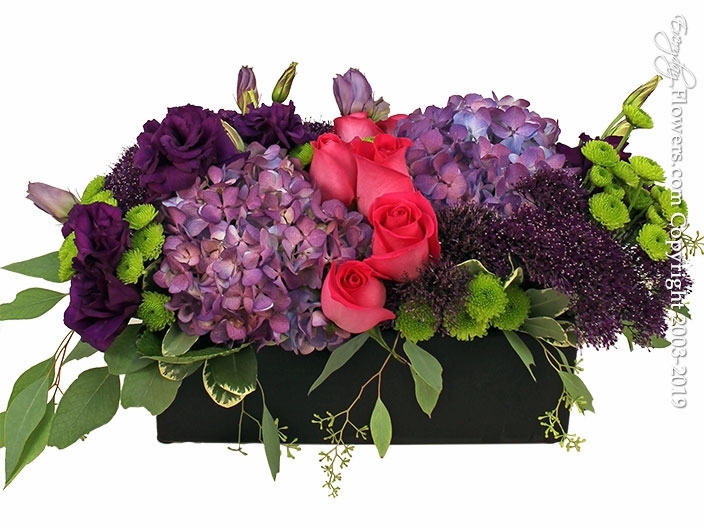 Flowers arranged and placed inside of a reusable gift box complete with matching lid. 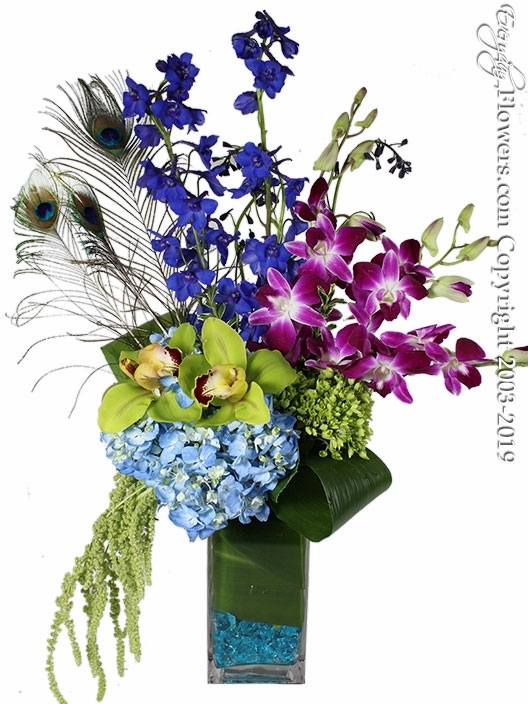 Each arrangement has upgrade options so your arrangement can be made bigger and the gift box for your arrangement will be bigger. 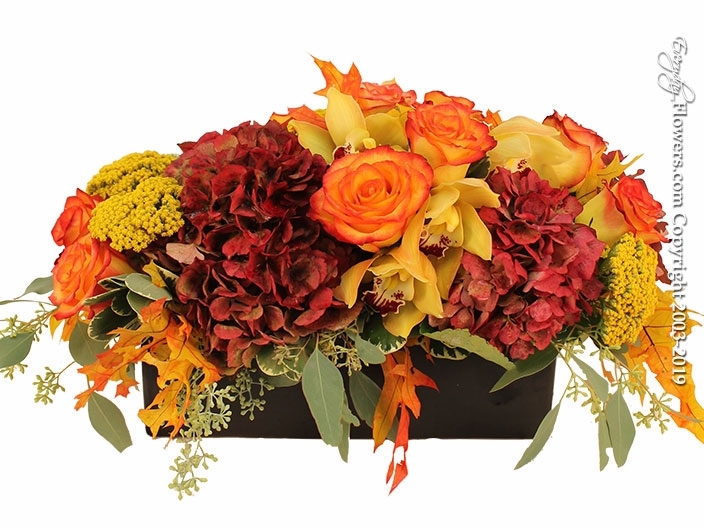 The arrangement is placed in disposable container so that all you need to do is lift it out of the Gift Box and discard. 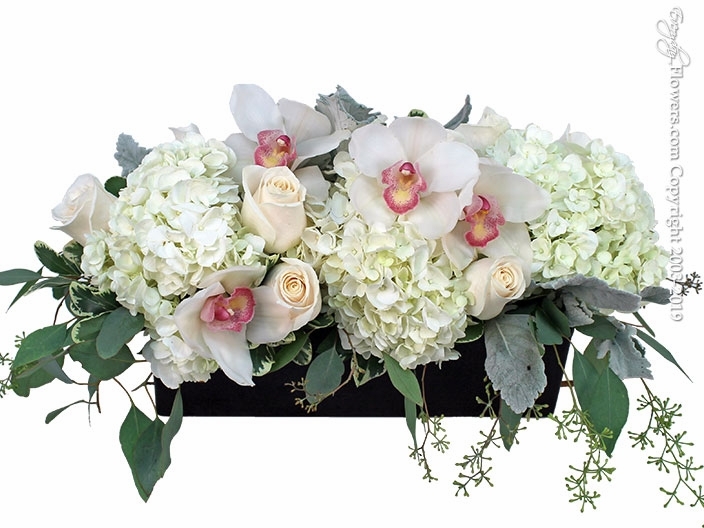 Flower Arrangements Designed by Everyday Flowers. 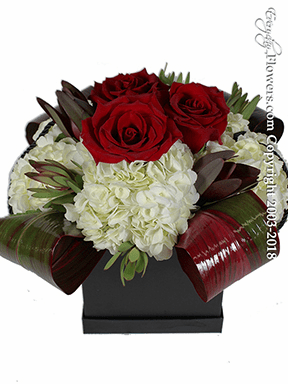 What makes us different is that we actually have developed our own flower arrangements that are designed and delivered by us. 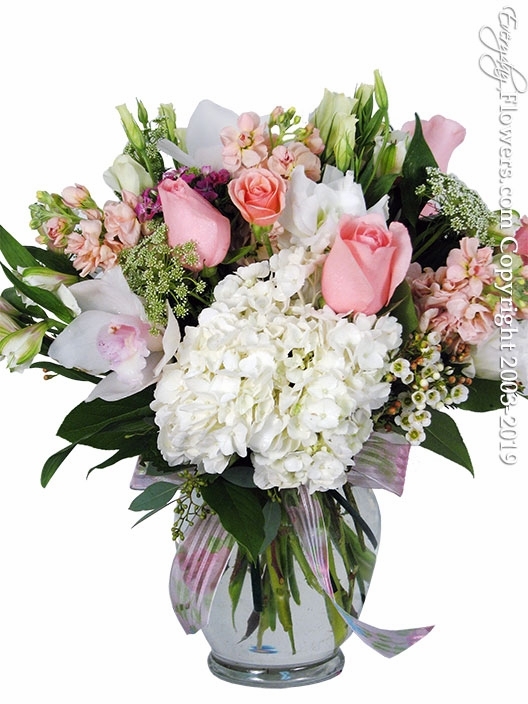 Listing to what our customers like we continue to create new and exciting arrangements created using only fresh flowers made available to us. 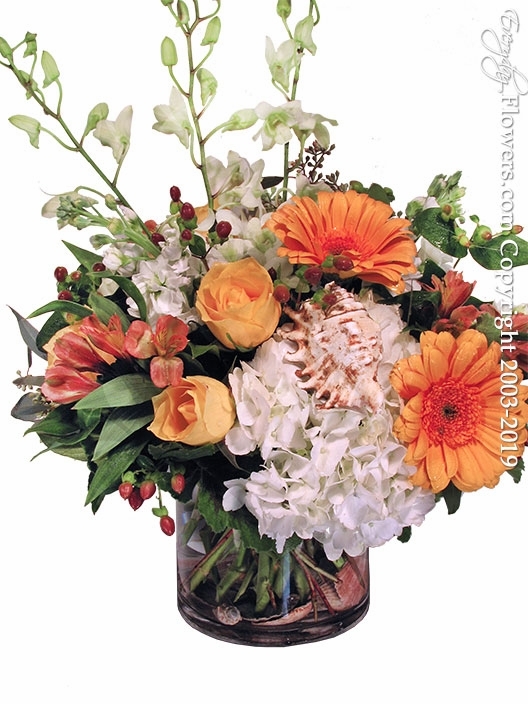 Our designers create all of our own arrangements and they really look like they do on our website.